Castle of Frankenstein magazine #29 - Mummy Issue! 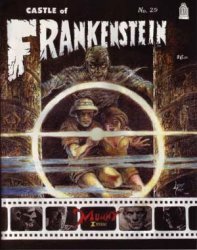 MyMovieMonsters.com > Monster Magazine Marketplace > Castle Of Frankenstein > Castle of Frankenstein magazine #29 - Mummy Issue! Castle of Frankenstein #29 is one of the revival issues after the initial run from 1962-1975. The New Adventures of Frankenstein Lives Again! 68 pages. Color cover and B&W pulp pages inside. Printed in Spring 2001.